You often see the claim made that Buddhism is a non-theistic religion. As is often the case, however, things are never quite so simple. There are ways in which the claim is true, ways in which it’s untrue, and even ways in which it’s just quasi-true. It makes my head hurt just to think about it. The claim of Non-theism is true in the sense that there is no God in Buddhism who is a Creator, Judge, or Deity-in-Charge. In Buddhist cosmology the universe has always just existed and is continually evolving and devolving based on causes and conditions. There’s no First Cause or Prime Mover setting the machinery in motion. In addition, the fate of human beings is determined by their own actions in accord with the laws of karma. There’s no Divine Intercessor putting one’s merits and demerits onto a permanent record card that follows one around over countless lifetimes. 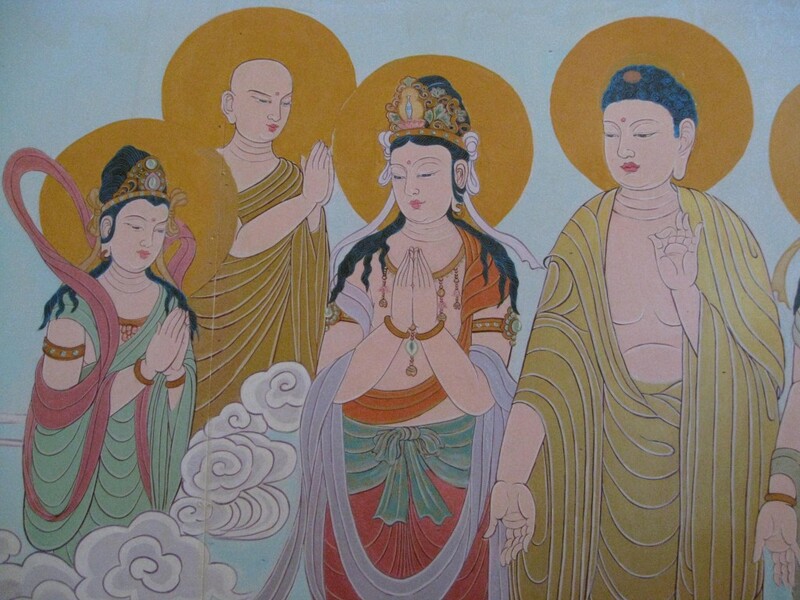 The claim of Non-theism is not completely true because the Buddhist suttas and sutras make reference to all sorts of supernatural beings who inhabit the universe, from ghosts, demi-gods, devas, and brahmās to celestial buddhas and bodhisattvas. The Buddha, himself, is often described as “a teacher of gods and men”. The ghosts, devas, and brahmās are reborn into their own realms, and the celestial buddhas reside in Pure Lands. As you might imagine, all of this leads to a very complicated cosmological space. At times these beings visited the Buddha in our world. At times he went to their realms to teach the Dharma. In the Brahmajāla Sutta, the Buddha describes how a brahmā may come by the mistaken belief that he is the “Great Brahmā, the Conqueror, the Unconquered, the All-Seeing, the All-Powerful, the Lord, the Maker and Creator, Ruler, Appointer, and Orderer, Father of All that Have Been and Shall Be.” The Buddha sees this delusion as an natural consequence of the particular way the universe happens to expand after periods of contraction. During this expansionary phase one of the beings residing in the Ābhāsvara realm (which corresponds to the second jhāna) is reborn alone into the lower Brahmā realm (corresponding to the first jhāna) through exhaustion of his accumulated merit. Forgetting his former lives, he imagines having come into existence spontaneously and without cause. Brahmās are long-lived beings and over the eons this solitary brahmā becomes lonely and wishes for company. When others come to co-inhabit his space through the natural process of rebirth, the brahmā mistakenly believes his wish for company made it happen. This is the start of his delusional grandiosity. The gods within the Buddhist cosmology are not omniscient, and they apparently need Buddhas to help straighten themselves out. Western Buddhist communities, on the other hand, are often made up of converts who have left a prior theistic belief in an Abrahamic Sky God behind. They often view celestial beings as outdated cultural vestiges which can be safely jettisoned without changing the essential meaning of the Dharma. Western Buddhists are the foremost promulgators of the idea that Buddhism is non-theistic. There are three additional issues, however, which complicate the relationship between Buddhism and theism even further. Deity yoga is a practice within the Tibetan Vajrayāna tradition. In deity yoga, a particular deity/bodhisattva/Buddha (the lines between these concepts get quite blurred) is taken as one’s yidam, or tutelary deity. One engages in complex mental visualizations of one’s yidam, then engages in a process of imitating and merging with one’s yidam, and finally one dissolves the merged self/yidam. The yidam is seen as having an existence within relative reality (within a Pure Land saṃbogakāya realm), but as being essentially empty in terms of absolute reality, so that it’s both real and unreal at the same time. In yet a third understanding of the yidam’s reality, the yidam is a representation of one’s own unrealized Buddha nature. Finally, the yidam is a means to exploring the reality of identity itself. We have our usual view of ourselves as limited and unable to become a Buddha. In deity yoga one practices giving up that limited self-view and tries on a different narrative in which one has the unlimited wisdom and compassion of a Buddha. In the end both narratives yield to the realization of emptiness. Asking a celestial Buddha for assistance is a practice within Pure Land Buddhism. Pure Land Buddhism teaches that one cannot reach enlightenment through one’s own efforts, but if one recites the mantra of Amitābha Buddha one will be reborn into his Pure Land after death and will achieve enlightenment from there. Having faith in a Buddha’s divine intervention seems similar in some ways to theistic beliefs and practices in the West. Keep in mind, however, that Amitābha Buddha is neither a creator nor a judge. He offers assistance to all who recite his mantra. Prior to achieving Buddhahood, Amitābha Buddha was a simple monk who declared an intention to create an ideal realm for Buddhist practice. There’s one final issue concerning Theism and Buddhism which is probably unique to Western Buddhism. I currently sit with a Zen group that meets in a church, has a Jesuit priest as its roshi, and a priest who’s a former Carthusian monk as a regular visiting teacher. Dharma talks sometimes include references to Jesus and/or God. I personally don’t find god-talk helpful to my Buddhist practice, and I’ll say more about my personal reactions in a future post about how to listen to Dharma talks. But it’s evidently helpful to those who are using it, and I suspect to more than a few of my fellow listener/sitters. I imagine their concept of God has evolved from a concrete, personified creator-controller-and-judge deity to something coexistant with creation itself, maybe a synonym for the ground-of-being. You can certainly find strains within the Christian mystic, Sufi, and Kabbalistic traditions to support such a view. There are those who believe in the concept of the perennial philosophy, the idea that the mystical experience has the same content regardless of religion, and that underneath the hood all religions point to the same experience. I think that many of those who are comfortable with god-talk in a Dharma talk believe there’s no fundamental contradiction between being a Theist and practicing Buddhism, or at least practicing Zen. I recently heard Roshi Robert Kennedy, who’s both a Jesuit priest and a Zen master, talk about this issue with great subtlety. He considers himself a Zen practitioner, but not a Buddhist. He understands that the Buddhist and Christian views of the ultimate nature of reality are not really reconcilable, but he also believes that sitting zazen is a practice without theological content. You don’t have to believe in anything to sit. I suspect roshi believes that the truths (with a small “t”) that emerge from sitting are not the provenance of any religion and that sitting assists our maturation as human beings regardless of our religious beliefs. But I don’t want to put words in Roshi’s mouth. So is Buddhism theistic or non-theistic?